Is Obama a Secret Catholic? Barack Obama’s July 1 speech in Zanesville, Ohio, suggested a “secret” connection to Catholicism. I say “secret” because Obama has never fully explained his work for the Catholic Church’s Campaign for Human Development in Chicago. He did say that the experience “led me into public service.” Whatever the origins of his neighborhood work in Chicago, he has offered a theology of social activism consonant with Catholic teaching. Obama’s Catholic-sounding theology came in response to an attack a week before by James Dobson, Evangelical leader of the Focus on the Family. Among Dobson’s vitriolic accusations were that Obama “distorted the bible” and held to a “fruitcake interpretation” of the Constitution. To find ammunition for his attack on the Democrat, Dobson pointed to a June 2006 address Obama had made to the Catholic* organization, Call to Renewal. On that occasion, Obama’s presentation embraced a reasonable facsimile of Catholic Natural Law doctrine. Unlike faith which is based on belief, said Obama, “politics depends on our ability to persuade each other of common aims based on a common reality.” That same day, Obama articulated the Catholic ethical principle of proportionality, modified his stance about abortion and confessed admiration for the saintly Dorothy Day, co-founder of the Catholic Worker organization. Dobson, for his part, places faith and reason in opposition, making dialog about ethics impossible except among believers. Moreover, every word of scripture – Old Testament as well as New Testament – is literally true, without the nuance used by Obama and Catholic doctrine. I won’t attack James Dobson for his Evangelical theology, but that doesn’t mean that I have to believe it is as good as Catholic theology. In fact, I think it’s time in politics for attention to a religion other than that of Evangelicals; hence this column. In his Ohio speech, Obama promised to give “faith-based partners like Catholic Charities and Lutheran Services and secular nonprofits like Public/Private Ventures the support they need to help other groups build and run effective programs.” Thus, instead of pitting the Church-related groups against non-religious groups in the Bush-Dobson style, Obama says he’ll put them together. The senator’s community organizer approach relies on experience in poor neighborhoods rather than ideological purity about separation of church and state. Liberal critics who oppose all faith-based initiatives need to recognize the Senator’s pragmatic approach to combat poverty in places where churches are central. Moreover his proposal would tend to fund neighborhood coalitions that include churches, while prohibiting funding one church alone. He uses Catholic Charities as the model: not to use federal money to proselytize and not to discriminate against clients or staff on the basis of religion. The money will go directly to the program and not to the Church. This formula — used by Catholic Charities — has been chosen by Obama as the model for his administration, even though it reverses the Bush policies. 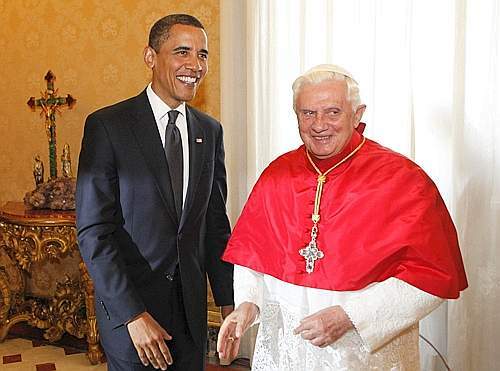 Is using Catholic theology to be followed by Obama becoming a Catholic? Since the Illinois Senator is looking for a new church to replace the UCC congregation of the Rev. Wright, one might speculate. (If there is to be an official conversion, I think it would come at the end of political office as happened with Britain’s Tony Blair). But you don’t have to endorse Obama to admit that his position merits attention in Catholic America.